Who Pays for “Free” Park-and-Ride Parking? Park-and-ride lots, writes Matt Steele at Streets.mn, are the “darling infrastructure of the transit planning profession.” In exchange for providing a parking spot at no charge to suburban commuters, says Steele, transit systems can increase ridership. But “free” suburban parking isn’t such a sweet deal for everyone. 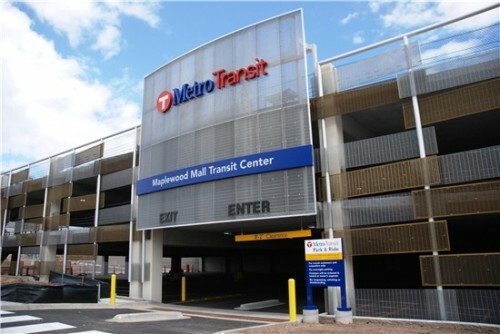 Steele writes that a Metro Transit park-and-ride expansion at the Maplewood Mall station, outside Minneapolis, cost around $24,000 per space to build. Meanwhile, transit riders in the city proper continue to be shortchanged. In Minneapolis, we’re lucky to have anything more than a sign at our transit stops. We have plenty of room for improvement for our local service. But we instead choose to binge on ridership growth on the fringe, no matter how much money it costs us to “buy” those riders. Yet there are opportunity costs: For less than the cost of two Maplewood park and rides serving up to (2×580=) 1160 parked cars, we’re building a full Arterial BRT line on Snelling Avenue scheduled to open next year. Those improvements will serve an estimated ridership of 8,700. And, unlike additional parking spaces, these amenities serve all riders (not just the 3,000 new ones). This is 7.5 times more productive than the same investment in parking. Taking maintenance, lighting and other upkeep expenses into account, and considering that many spaces go unused, Steele says Maplewood Mall commuters would need to pay a $9.50 parking fee to cover costs. Elsewhere on the Streetsblog Network: Bike Portland reports that Elly Blue’s “Wheelwomen Switchboard” is up and running; a guest writer for NRDC Switchboard surveys the streets of Bangkok, Thailand, after a 25-year absence; and Copenhagenize discovers that playing in the streets of Los Angeles is actually against the law.